438 Marlborough is located on the south side of Marlborough, between Massachusetts Avenue and Charlesgate East, with 436 Marlborough to the east, and 440 Marlborough to the west. 438 Marlborough was designed by architect Obed F. Smith and built in 1885-1886 by Charles H. Dodge, mason, for building contractor George Wheatland, Jr., for speculative sale, one of six contiguous houses (430-432-434-436-438-440 Marlborough), arranged in a symmetrical group, the three to the east (430-434 Marlborough) with bays on the eastern side, and the three to the west (436-440 Marlborough) with bays on the western side. The peaks of the bays have varied designs. George Wheatland, Jr., is shown as the owner on the original building permit for 438 Marlborough, dated October 16, 1885. At the same time, George Wheatland, Jr., was having six more houses built at 381-391 Commonwealth on the lots to the south, behind 430-440 Marlborough, also designed by Obed Smith and built by Charles Dodge. 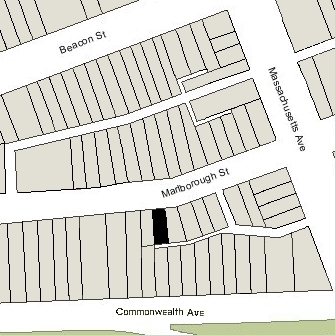 Click here for an index to the deeds for 438 Marlborough, and click here for further information on the land west of Massachusetts Avenue between the south side of Beacon and the north side of Commonwealth. On January 4, 1887, 438 Marlborough and 440 Marlborough were purchased from George Wheatland, Jr., by wholesale lumber merchant Edward Jonathan Hammond. He and his wife, Alice Ida (Eastman) Hammond, made 440 Marlborough their home. 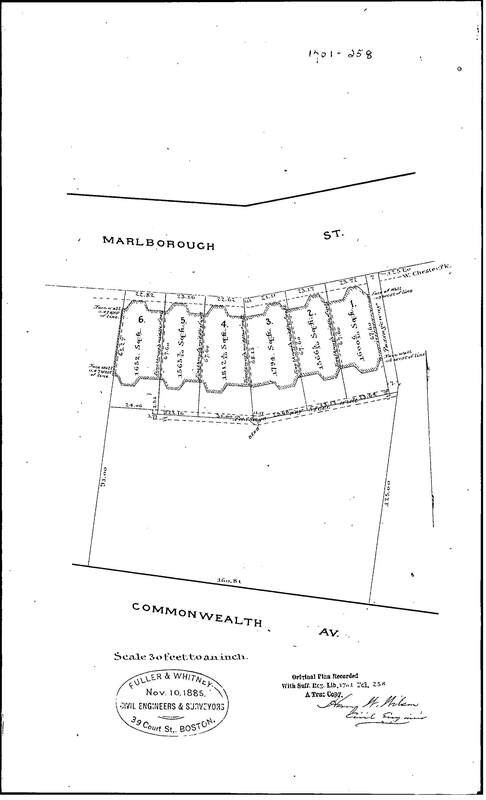 On January 4, 1888, 438 Marlborough was acquired from Edward Hammond by Sarah A. (Garland) Kennard, the widow of Daniel Kennard. She previously had lived in the Wollaston district of Quincy where she and her husband had owned a farm. He had died there in January of 1884. Sarah Kennard died in April of 1890. In her will, she left her daughters, Minnie G, Kennard and Edith M. Kennard, and her sons, Harrison G. Kennard, Charles E. Kennard, and Frank E. Kennard, two dollars each. She named her eldest daughter, Eugenie (Jennie) Kennard, her executor and left her entire estate to her. 438 Marlborough became the home of Eugenie, Minnie, and Edith Kennard. On March 12, 1891, Eugenie Kennard transferred 438 Marlborough into Minnie Kennard’s name, and on September 6, 1892, Minnie Kennard transferred it to Eugenie and Edith Kennard. On November 16, 1892, Eugenie Kennard transferred her one-half interest to Edith Kennard. Eugenie Kennard married in November of 1892 to General Thomas R. Mathews, a widower. On November 16, 1892, prior to her marriage, she transferred her interest in 438 Marlborough to Edith Kennard. 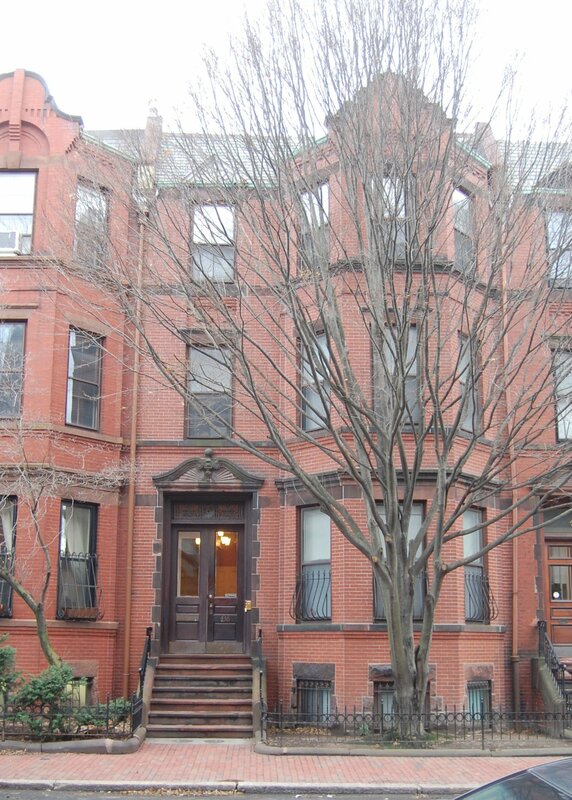 After their marriage, Thomas and Eugenie Mathews lived briefly at 8 Wayne in Roxbury and then made 438 Marlborough their home. Thomas Mathews was a wholesale coffee merchant. He had served in the Civil War and, in addition to his business, was an officer of the Massachusetts militia, rising to the rank of brigadier general, serving as commander of the Massachusetts Coast Guard, and retiring in 1904. Minnie Kennard continued to live at 438 Marlborough until the mid-1890s, when she moved to Quincy to live on the family farm with her brothers, Harrison and Frank Kennard. The Mathewses and Edith Kennard continued to lived at 438 Marlborough and in Quincy. During the 1902-1903 winter season, they were living elsewhere and 438 Marlborough was the home of Welthea Loring (Malbon) Bremer, the widow of William Mathias Bremer, and their adult children, Maud Clifton Bremer and Clifton Long Bremer, a lawyer. They had lived at The Charlesgate at 535 Beacon the previous season. By the 1903-1904 season, they had moved to the Hotel Tuileries at 270 Commonwealth. The Mathewses resumed living at 438 Marlborough during the 1903-1904 season, but were again living elsewhere during the 1904-1905 season, and 438 Marlborough was the home of Dr. Edward Stickney Wood and his wife, Elizabeth A. (Richardson) Wood. They previously had lived at The Holland at 50 Commonwealth. They also maintained a home in Pocasset. Dr. Wood was a professor of medical chemistry at Harvard Medical School. A specialist in analyzing human blood, he was an expert witness in numerous murder cases. The Woods moved from 438 Marlborough after the 1904-1905 season, and he died in July of 1905. Edith Kennard resumed living at 438 Marlborough during the 1905-1906 winter season, but thereafter she and the Mathewses made their year-round home in Quincy. During the 1906-1907 winter season, 438 Marlborough was the home of William Adams Copeland and his wife, Ida May (Haynes) Copeland. They previously had lived in Melrose. He was a manufacturer of shoe tree machinery. They had moved by the 1907-1908 season and by 1909 were living in Newton. By the 1907-1908 winter season, 438 Marlborough was the home of Mary Caroline (Painter) May, the wife of Charles William May, who was living abroad, and their two daughters, Mary Caroline Spencer May and Lucy Isabelle May. They previously had lived at 337 Marlborough. Mary Caroline Spencer May operated a school at 339 Marlborough and Lucy Isabelle May was one of the teachers. They continued to live at 438 Marlborough during the 1908-1909 season, after which they moved to an apartment at 222 Marlborough. By the 1909-1910 winter season, 438 Marlborough was the home of Arthur S. Austin, a banker and note broker, and his unmarried sisters, Harriet Almira Austin and Caroline W. Austin. They previously had lived in Brookline. They also maintained a home in Swampscott. On March 27, 1913, 438 Marlborough was purchased from Edith Kennard by Maria Antoinette (Hunt) Evans, the widow of Robert Dawson Evans. She lived at 17 Gloucester. Arthur, Harriet, and Caroline Austin continued to live at 438 Marlborough. Maria Evans died in October of 1917. In her will, she left 438 Marlborough to Arthur Austin. He died died in January of 1924 and Caroline Austin died in November of 1929. Harriet Austin continued to live at 438 Marlborough, where she celebrated her 100th birthday on September 25, 1931. She moved soon thereafter and died in Hopedale in 1935. On August 22, 1932, 438 Marlborough was purchased from Harriet Austin by Mrs. Sarah Elizabeth (Williams) Hodson, the former wife of Septimus Hodson. She was a secretary in the real estate offices of J. Sumner Draper. 438 Marlborough was not listed in the 1933 and 1934 Blue Books. On April 5, 1933, 438 Marlborough was acquired from S. Elizabeth Hodson by Dr. Whitman King Coffin, a physician, and his wife, Rosaline (Moncrieff) Coffin. He also maintained his medical office there. They previously had lived in Medford and he had maintained his office at 416 Marlborough. By the 1940s, they also maintained a home on Swan Island in Maine. The Coffins continued to live (and he to maintain his office) at 438 Marlborough until about 1962. On August 15, 1962, 438 Marlborough was purchased from the Coffins by real estate dealer Francis Ralph Sundbergh and his wife, Julia (Abraham) Sundbergh. On March 18, 1965, 438 Marlborough was acquired from the Sundberghs by A. George Russo, and on January 23, 1968, it was acquired from him by Alexander Paul Kocsy. In November of 1968, Alexander Kocsy was cited by the Building Department for failing to maintain the building and also for allowing it to be occupied as a four-family dwelling when its legal occupancy was a single-family dwelling. On March 8, 1977, the East Cambridge Savings Bank foreclosed on a mortgage given by Alexander Kocsy and sold 438 Marlborough to Alan Victor DiPietro. In May of 1977, he filed for permission to convert the property from a single-family dwelling into four apartments. The permit was abandoned. He filed again in September of 1977 and, once again, the permit was abandoned. Alan DiPietro died in April of 1995 and 438 Marlborough became the property of his mother, Celia L. (Bagnulo) DiPietro, the wife of Carmine DiPietro. They lived in Revere. On November 18, 1997, she transferred the property to herself and her husband as trustees of the 438 Marlborough Street Realty Trust. Carmine DiPietro died in November of 2004 and Celia DiPietro died in May of 2011. On January 26, 2012, 438 Marlborough was acquired from Sally (DiPietro) Pacheco, daughter of Carmine and Celia DiPietro and successor trustee, by the 438 Marlborough Street LLC (John Tavano, manager). 438 Marlborough was assessed as four-to-six family dwelling in 2018.